Several weeks ago, I was “outed” as one of Donald Trump’s two advisors on the relationship between the United States of America and the State of Israel. It is an honor and a privilege to advise Mr. Trump on a critical issue that is near and dear to my heart, and I fervently hope that I have the opportunity to assist him in developing and implementing policies that strengthen both countries and the unbreakable bond between them. Right now, however, the bloodsport of American presidential politics is in full bloom, and within that scented garden emerges a recent Op-Ed piece by CNN panelist, Peter Beinart, published in Israel’s left-wing paper Haaretz. Beinart, a well-known supporter of J Street, New Israel Fund and the BDS movement, decries Trump’s selection of Israel advisors as a cynical charade by which Trump leverages Jews in his employ to go “all in” on Israel solely to garner political capital. According to Beinart, these token Jews, myself included, are just willing pawns in a modern day Game of Thrones, all willing to fall on their proverbial swords for Trump the King. I have never met Mr. Beinart nor do I care to, and he knows absolutely nothing about me. Had he made the slightest inquiry (apparently no longer necessary for modern journalists), he would have known that I am not in Mr. Trump’s employ, have hundreds of other clients, and hold views on Israel that are entirely independent of any political movement or candidate. Those views have been developed over more than thirty years of study of historical accounts and scholarly works, interaction with Israeli political, military and business leaders, and probably 100 trips or more to the Holy Land. I didn’t just come out of “central casting,” as Beinart implies, to facilitate some political theatre, and my beliefs are not for sale to the highest bidder. The same holds true for Jason Greenblatt, Mr. Trump’s other advisor, whom I have known for years. But I do want to thank Mr. Beinart for getting this issue out on the table, albeit clumsily and disingenuously. Because his reflexive reaction to my involvement in the Trump candidacy lays bare how dangerous the Jewish left is to the State of Israel. Let’s look at the criticisms offered by Mr. Beinart of views that I have previously expressed. He thinks I’m no good because (1) I have accused President Obama of “blatant anti-Semitism,” (2) I have questioned the wisdom of Israel bestowing the benefits of citizenship, including free tuition at some of its best universities, upon those who advocate the overthrow of the State, and (3) I have likened J Street supporters to “kapos during the Nazi era.” Let’s unpack each of those a bit. Second, the wisdom of free stuff for those engaged in advocating the overthrow of the State of Israel. Every civilized country other than Israel punishes treason. In the United States, advocating to overthrow the government by force or violence can get you life in prison. In Israel, Islamic radical citizens speak this way all the time, often on the way back and forth from world class institutions of higher learning which they attend for free. Is this a good idea? Is there no minimal allegiance required for Israeli citizenship? Sure seems like a fair question to me. Mr. Beinart, therefore, has done us a service, albeit unintentionally. He has shown us the danger of the Jewish left – the lost souls who blame Israel for not making a suicidal “peace” with hateful radical Islamists hell bent on Israel’s destruction. This is Hillary Clinton’s crowd, and they are no friends of Israel. So please read Peter Beinart’s latest column. It will leave you convinced to vote for Donald Trump. Certainly, the reporting on the current events in Israel reflects old habits about ‎how most journalists cover stories of Palestinian violence and Israeli responses. ‎Two standbys always work. One if that there is “a cycle of violence” ( a pox on both ‎your houses), always leaving unclear who the original perpetrators were in an ‎individual attack or group of attacks. A second is to keep a daily scorecard of the ‎comparative body counts, especially when there are more Palestinian casualties ‎and fatalities than Israeli, courtesy of Israeli police or soldiers responding to ‎stabbing attacks, not all of which prove lethal before the attacker is neutralized. ‎This narrative leads to the inevitable charge of disproportionality, one that has ‎become the principal media assault on Israeli responses to terror emanating from ‎Gaza in recent years. As in every other instance in recent years, Haaretz is playing ‎its appointed role of feeding the many international journalists in the country with ‎the “truth in English” as it sees it, and as the international media want to receive ‎and see it, confirming all their established biases about Israel behavior. When the administration’s top spokesperson makes this kind ‎of comment, do you think Abbas will decide to ease ‎up on the violence accelerator? Israel should now be calculating the exact extent or subtlety with which it should consider communicating key portions of its nuclear posture and positions. Naturally, Israel should never reveal any too-specific information about its nuclear strategy, its nuclear hardening, or even its nuclear yield-related capabilities. Still, sometimes, the duty of finely-honed intelligence services should not be to maximize strategic secrecy, but rather, to carefully “share” certain bits of pertinent information. How will Russia respond to any ramped up American uses of force in the Middle East, and, more plausibly, vice-versa? One must assume that Jerusalem is already asking these key questions, and even wondering whether, in part, greater mutualities of interest could sometime exist with Moscow than with Washington. There are some additional ironies yet to be noted. Almost certainly, ISIS, unless it is first crushed by U.S. and/or Russian-assisted counter-measures, will plan to march westward across Jordan, ultimately winding up at the borders of West Bank (Judea/Samaria). There, ISIS Jihadists could likely make fast work of any still-posted Hamas and Fatah forces, in effect, taking over what might once have become “Palestine.” In this now fully imaginable scenario, the most serious impediment to Palestinian statehood is not Israel, but rather a murderous band of Sunni Arab terrorists. What about the larger picture of “Cold War II?” Israeli defense planners will need to factor into their suitably nuanced calculations the dramatically changing relationship between Washington and Moscow. During “Cold War I,” much of America’s support for the Jewish State had its most fundamental origins in a perceived need to compete successfully in the Middle East with the then Soviet Union. In the progressive development of “Cold War II,” Jerusalem will need to carefully re-calculate whether a similar “bipolar” dynamic is once again underway, and whether the Russian Federation might, this time around, identify certain strategic benefits to favoring Israel in regional geo-politics. In all such strategic matters, once Israel had systematically sorted through the probable impact of emerging “superpower” involvements in the Middle East, Jerusalem would need to reassess its historic “bomb in the basement.” Conventional wisdom, of course, has routinely pointed in a fundamentally different policy direction. Still, this “wisdom” assumes that credible nuclear deterrence is simply an automatic result of physically holding nuclear weapons. By the logic of this too-simplistic argument, removing Israel’s nuclear bomb from the “basement” would only elicit new waves of global condemnation, and would likely do so without returning any commensurate security benefits to Jerusalem. Scholars know, for good reason, that the conventional wisdom is often unwise. Looking ahead, the strategic issues facing Israel are not at all uncomplicated or straightforward. Moreover, in the immutably arcane world of Israeli nuclear deterrence, it can never really be adequate that enemy states merely acknowledge the Jewish State’s nuclear status. Rather, it is also important that these states should be able to believe that Israel holds usable nuclear weapons, and that Jerusalem/Tel-Aviv would be willing to employ these usable weapons in certain clear, and situationally recognizable, circumstances. Current instabilities in the Middle East will underscore several good reasons to doubt that Israel could ever benefit from any stubborn continuance of deliberate nuclear ambiguity. It would seem, too, from certain apparent developments already taking place within Mr. Netanyahu’s “inner cabinet,” that portions of Israel’s delegated leadership must now more fully understand the bases of any such informed skepticism. In essence, Israel is imperiled by compounding and inter-related existential threats that justify its fundamental nuclear posture, and that require a correspondingly purposeful strategic doctrine. This basic need exists well beyond any reasonable doubt. Without such weapons and doctrine, Israel could not expectedly survive over time, especially if certain neighboring regimes, amid expanding chaos, should soon become more adversarial, more Jihadist, and/or less risk-averse. Incontestably, a purposeful nuclear doctrine could prove increasingly vital to coping with various more-or-less predictable strategic scenarios for Israel, that is, those believable narratives requiring preemptive action, and/or an appropriate retaliation. In other words, doctrine can serve an increasingly imperiled state as a critical form of communication, one directed to its friends, and also to its foes. Israel can benefit from just such broadened understandings of doctrine. The principal security risks now facing Israel are really more specific than general or generic. This is because Israel’s extant adversaries in the region will likely be joined, at some point, by: (1) a new Arab state of “Palestine;” and/or by (2) a newly-nuclear Iran. It is also because of the evidently rekindled global spark of “bipolar” or “superpower” adversity, and the somewhat corollary insertion of additional American military forces to combat certain new configurations of Jihadi terror. For Israel, merely having nuclear weapons, even when fully recognized in broad outline by enemy states, can never automatically ensure successful deterrence. In this connection, although starkly counter-intuitive, an appropriately selective and thoughtful end to deliberate ambiguity could improve the overall credibility of Israel’s nuclear deterrent. With this point in mind, the potential of assorted enemy attack prospects in the future could be reduced by making available certain selected information concerning the safety of Israel’s nuclear weapon response capabilities. This crucial information, carefully limited, yet more helpfully explicit, would center on the distinctly major and inter-penetrating issues of Israeli nuclear capability and decisional willingness. Skeptics, no doubt, will disagree. It is, after all, seemingly sensible to assert that nuclear ambiguity has “worked” thus far. While Israel’s current nuclear policy has done little to deter multiple conventional terrorist attacks, it has succeeded in keeping the country’s enemies, singly or in collaboration, from mounting any authentically existential aggressions. This conclusion is not readily subject to any reasonable disagreement. More than any other imperiled state on earth, Israel needs to steer clear of such a tipping point. This, too, is not subject to any reasonable disagreement. Excluding non-Arab Pakistan, which is itself increasingly coup-vulnerable, none of Israel’s extant Jihadi foes has “The Bomb.” However, acting together, and in a determined collaboration, they could still carry out potentially lethal assaults upon the Jewish State. Until now, this capability had not been possible, largely because of insistent and persistently overriding fragmentations within the Islamic world. Looking ahead, however, these same fragmentations could sometime become a source of special danger to Israel, rather than remain a continuing source of national safety and reassurance. An integral part of Israel’s multi-layered security system lies in the country’s ballistic missile defenses, primarily, the Arrow or “Hetz.” Yet, even the well-regarded and successfully-tested Arrow, now augmented by the newer and shorter-range iterations of “Iron Dome,” could never achieve a sufficiently high probability of intercept to meaningfully protect Israeli civilians. No system of missile defense can ever be “leak proof,” and even a single incoming nuclear missile that somehow managed to penetrate Arrow or corollary defenses could conceivably kill tens or perhaps hundreds of thousands of Israelis. In principle, at least, this fearsome reality could be rendered less prospectively catastrophic if Israel’s traditional reliance on deliberate ambiguity were suitably altered. Why alter? The current Israeli policy of an undeclared nuclear capacity is unlikely to work indefinitely. Leaving aside a Jihadi takeover of already-nuclear Pakistan, the most obviously unacceptable “leakage” threat would come from a nuclear Iran. To be effectively deterred, a newly-nuclear Iran would require convincing assurance that Israel’s atomic weapons were both (1) invulnerable, and (2) penetration-capable. Any Iranian judgments about Israel’s capability and willingness to retaliate with nuclear weapons would then depend largely upon some prior Iranian knowledge of these weapons, including their expected degree of protection from surprise attack, as well as Israel’s expected capacity to “punch-through” all pertinent Iranian active and passive defenses. Jurisprudentially, at least, following JCPOA in Vienna, a nuclear weapons-capable Iran is a fait accompli. For whatever reasons, neither the “international community” in general, nor Israel in particular, had ever managed to create sufficient credibility concerning a once-timely preemptive action. Such a critical defensive action would have required very complex operational capabilities, and could have generated Iranian/Hezbollah counter actions that might have a very significant impact on the entire Middle East. Nevertheless, from a purely legal standpoint, such preemptive postures could still have been justified, under the authoritative criteria of anticipatory self-defense, as permitted under customary international law. It is likely that Israel has undertaken some very impressive and original steps in cyber-defense and cyber-war, but even the most remarkable efforts in this direction will not be enough to stop Iran altogether. Earlier, the “sanctions” sequentially leveled at Tehran – although certainly better than nothing – could have had no tangible impact on effectively halting Iranian nuclearization. Strategic assessments can sometimes borrow from a Buddhist mantra. What is, is. Ultimately, a nuclear Iran could decide to share some of its nuclear components and materials with Hezbollah, or with another kindred terrorist group. Ultimately, amid growing regional chaos, such injurious assets could find their way to such specifically U.S- targeted groups as ISIS. Where relevant, Israeli nuclear ambiguity could be loosened by releasing certain very general information regarding the availability and survivability of appropriately destructive nuclear weapons. What about irrational enemies? An Israeli move from ambiguity to disclosure would not likely help in the case of an irrational nuclear enemy. It is even possible, in this regard, that particular elements of Iranian leadership might meaningfully subscribe to certain end-times visions of a Shiite apocalypse. By definition, any such enemy would not necessarily value its own continued national survival more highly than any other national preference, or combination of preferences. By definition, any such enemy would present a genuinely unprecedented strategic challenge. Were its leaders to become authentically irrational, or to turn in expressly non-rational directions, Iran could then effectively become a nuclear suicide-bomber in macrocosm. Such a profoundly destabilizing strategic prospect is improbable, but it is also not inconceivable. A similarly serious prospect exists in already-nuclear Pakistan. To protect itself against military strikes from irrational enemies, especially those attacks that could carry existential costs, Israel will need to reconsider virtually every aspect and function of its nuclear arsenal and doctrine. This is a strategic reconsideration that must be based upon a number of bewilderingly complex intellectual calculations, and not merely on ad hoc, and more-or-less presumptively expedient political judgments. Removing the bomb from Israel’s basement could enhance Israel’s strategic deterrence to the extent that it would heighten enemy perceptions of the severe and likely risks involved. This would also bring to mind the so-called Samson Option, which, if suitably acknowledged, could allow various enemy decision-makers to note and underscore a core assumption. This is that Israel is prepared to do whatever is needed to survive. Interestingly, such preparation could be entirely permissible under governing international law, including the 1996 Advisory Opinion of the International Court of Justice. There is a related observation. In our often counter-intuitive strategic world, it can sometimes be rational to pretend irrationality. The nuclear deterrence benefits of any such pretended irrationality would depend, at least in part, upon an enemy state’s awareness of Israel’s intention to apply counter-value targeting when responding to a nuclear attack. But, once again, Israeli decision-makers would need to be aptly wary of ever releasing too-great a level of specific operational information. When this critical moment arrives, Israel should already have configured (1) its presumptively optimal allocation of nuclear assets; and (2) the extent to which this preferred configuration should now be disclosed. Such strategic preparation could then enhance the credibility of Israel’s indispensable nuclear deterrence posture. When it is time for Israel to selectively ease its nuclear ambiguity, a second-strike nuclear force should be revealed in broad outline. This robust strategic force – hardened, multiplied, and dispersed – would need to be fashioned so as to recognizably inflict a decisive retaliatory blow against major enemy cities. Iran, it follows, so long as it is led by rational decision-makers, should be made to understand that the actual costs of any planned aggressions against Israel would always exceed any expected gains. In the final analysis, whether or not a shift from deliberate ambiguity to some selected level of nuclear disclosure would actually succeed in enhancing Israeli nuclear deterrence would depend upon several complex and intersecting factors. These include, inter alia, the specific types of nuclear weapons involved; reciprocal assessments and calculations of pertinent enemy leaders; effects on rational decision-making processes by these enemy leaders; and effects on both Israeli and adversarial command/control/communications operations. If bringing Israel’s bomb out of the “basement” were to result in certain new enemy pre-delegations of nuclear launch authority, and/or in new and simultaneously less stable launch-on-warning procedures, the likelihood of unauthorized and/or accidental nuclear war could then be substantially increased. Not all adversaries may be entirely rational. To comprehensively protect itself against potentially irrational nuclear adversaries, Israel has no logical alternative to developing an always problematic conventional preemption option, and to fashion this together with a suitable plan for subsequent “escalation dominance.” Operationally, especially at this very late date, there could be no reasonable assurances of success against many multiple hardened and dispersed targets. Regarding deterrence, however, it is noteworthy that “irrational” is not the same as “crazy,” or “mad,” and that even an expectedly irrational Iranian leadership could still maintain susceptible preference orderings that are both consistent and transitive. Even an irrational Iranian leadership could be subject to threats of deterrence that credibly threaten certain deeply held religious as well as civic values. The relevant difficulty here for Israel is to ascertain the precise nature of these core enemy values. Should it be determined that an Iranian leadership were genuinely “crazy” or “mad,” that is, without any decipherable or predictable ordering of preferences, all deterrence bets could then have to give way to preemption, and possibly even to certain plainly unwanted forms of war fighting. Such determinations, of course, are broadly strategic, not narrowly jurisprudential. From the discrete standpoint of international law, especially in view of Iran’s expressly genocidal threats against Israel, a preemption option could still represent a permissible expression of anticipatory self-defense. Again, however, this purely legal judgment would be entirely separate from any parallel or coincident assessments of operational success. There would be no point for Israel to champion any strategy of preemption on solely legal grounds if that same strategy were not also expected to succeed in specifically military terms. Growing chaotic instability in the Middle East plainly heightens the potential for expansive and unpredictable conflicts. While lacking any obviously direct connection to Middle East chaos, Israel’s nuclear strategy must now be purposefully adapted to this perilous potential. Moreover, in making this adaptation, Jerusalem could also have to pay special attention not only to the aforementioned revival of major “bipolar” animosities, but also, more specifically and particularly, to Russia’s own now-expanding nuclear forces. This cautionary warning arises not because augmented and modernized Russian nuclear forces would necessarily pose any enlarged military threat to Israel directly, but rather because these strategic forces could determine much of the way in which “Cold-War II” actually evolves and takes shape. Vladimir Putin has already warned Washington of assorted “nuclear countermeasures,” and recently test launched an intercontinental nuclear missile. One such exercise involved a new submarine-launched Bulava missile, a weapon that could deliver a nuclear strike with up to 100 times the force of the 1945 Hiroshima blast. Current adversarial Russian nuclear posturing vis-à-vis the United States remains oriented toward the Ukraine, not the Middle East. Nevertheless, whatever happens to U.S.-Russian relations in any one part of the world could carry over to certain other parts, either incrementally, or as distinctly sudden interventions or escalations. For Jerusalem, this means, among other things, an unceasing obligation to fashion its own developing nuclear strategy and posture with an informed view to fully worldwide power problems and configurations. Whether looking toward Gaza, West Bank (Judea/Samaria), Iran, Lebanon, Iraq, Jordan, Egypt, or Syria, Israel will need to systematically prioritize existential threats, and, thereafter, stay carefully focused on critically intersecting and overriding factors of global and regional security. In all such meticulously careful considerations, both chaos and Cold War II should be entitled to occupy a conspicuous pride of place. A further irony here concerns Palestinian “demilitarization,” a pre-independence condition of statehood called for by Israeli Prime Minister Benjamin Netanyahu. Should Palestinian forces (PA plus Hamas) ever actually choose to abide by any such formal legal expectation, it could makes these forces less capable of withstanding any foreseeable ISIS attacks. Realistically, however, any such antecedent compliance would be highly improbable. See, for earlier legal assessments of Palestinian demilitarization, Louis René Beres and (Ambassador) Zalman Shoval, “Why a Demilitarized Palestinian State Would Not Remain Demilitarized: A View Under International Law,” Temple International and Comparative Law Journal, Winter 1998, pp. 347-363; and Louis René Beres and Zalman Shoval, “On Demilitarizing a Palestinian `Entity’ and the Golan Heights: An International Law Perspective,” Vanderbilt Journal of Transnational Law, Vol. 28, No. 5, November 1995, pp. 959-972. There is another notable and more generic (pre-nuclear age) risk of placing too-great a reliance on defense. This is the risk that a corollary of any such reliance will be a prospectively lethal tendency to avoid taking otherwise advantageous offensive actions. Recall, in this connection, Carol von Clausewitz On War: “Defensive warfare…does not consist of waiting idly for things to happen. We must wait only if it brings us visible and decisive advantages. That calm before the storm, when the aggressor is gathering new forces for a great blow, is most dangerous for the defender.” See: Carl von Clausewitz, Principles of War, Hans W. Gatzke, tr., New York: Dover Publications, 2003, p. 54. For early authoritative accounts, by the author, of expected consequences of a nuclear attack, see: Louis René Beres, Apocalypse: Nuclear Catastrophe in World Politics (Chicago: University of Chicago Press, 1980); Louis René Beres, Mimicking Sisyphus: America’s Countervailing Nuclear Strategy (Lexington, Mass., Lexington Books, 1983); Louis René Beres, Reason and Realpolitik: U.S. Foreign Policy and World Order (Lexington, Mass., Lexington Books, 1984); and Louis René Beres, Security or Armageddon: Israel’s Nuclear Strategy (Lexington, Mass., Lexington Books, 1986). ICBM test launches are legal and permissible under the terms of New START, It does appear, however, that Russia has already developed and tested a nuclear-capable cruise missile with a range of 500-5500 KM, which would be in express violation of the Intermediate Nuclear Forces Treaty (INF). At the same time, current research into the U.S. Conventional Prompt Global Strike Program seeks to circle around INF Treaty limitations, by employing a delivery vehicle trajectory that is technically neither ballistic nor cruise. Russia, of course, is operating much more openly and substantially in Syria, but here, in the Middle East theatre, at least, Moscow’s public tone toward Washington is somewhat less confrontational or adversarial. (Obama was a member of the Reverend Mr. Wright’s church for some twenty years. However, he never heard a single word that he said. The man who married Barack and Michelle Obama, baptized their daughters, gave him the title of one of his books, and was the only beneficiary of his charity dollars before Obama’s presidential run, has made a remarkably ignorant antisemitic claim. The Rev. 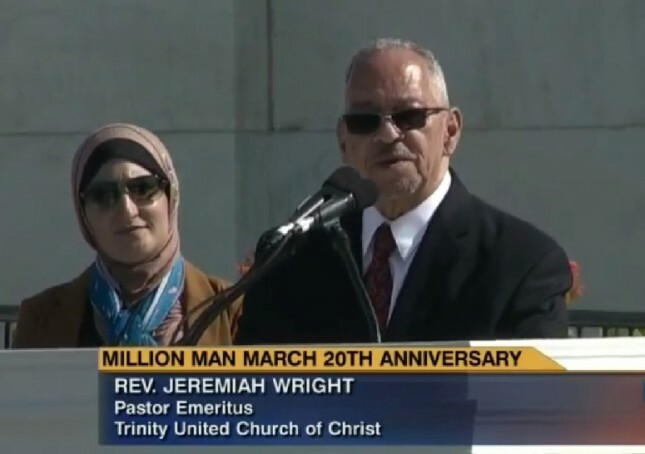 Jeremiah Wright, former pastor of President Barack Obama, offered the traditional Muslim greeting — “salaam alaikum” — at the beginning of his speech at the 20th anniversary of the Million Man March in Washington on Saturday. Then the pastor emeritus of Chicago’s Trinity United Church of Christ launched into an appeal for “Palestinian justice” and for blacks to stand with them. Not mentioning Israelis, he called Palestinians the “original people” — and then offered the crowd a reminder. “Please remember, Jesus was a Palestinian,” Wright said. Wright also said that youths in Ferguson, Missouri, and youths “in Palestine” have “united” and that blacks should join them.